A hunting group in Germany that calls itself the "Crowbusters" is trying to kill as many crows as possible. The Crowbusters' kill rates are unusually high thanks to their military-grade equipment. During a hunt in the Upper Franconia region of Bavaria, the Crowbusters impressed local hunters by bringing down a total of 316 "crap-scratchers." Farmers, who don't like it when curious crows peck at the plastic covers on silage bales, had spread liquid manure on their fields to lure the birds. The headline "80 Against Unlucky Raven" appeared in a Wild und Hund story describing the biggest crow hunt the publication had ever organized. The shootout in the sky took place last year in the Münsterland region of northwestern Germany, and it was broadcast live on the online forum of Wild und Hund. By the end of the hunt, 333 crows lay dead, 80 percent of which were young birds. Six magpies also fell victim to the slaughter. In a hunt like this, says ornithologist Ulrich Mäck, it's almost impossible to avoid killing protected species, such as rooks and jackdaws. "Especially during the colder half of the year," he adds, "birds in the crow family tend to fly in mixed flocks." The excuse for this slaughter is that crows are causing the declines of rabbits, gamebirds, and songbirds – declines that are more likely caused by the spread of agricultural practices that reduce the hedgerows and meadows that provide habitat for those birds and animals. In other words, killing large numbers of crows is unlikely to helps those birds and animals and may hurt some protected species that have the misfortune of associating with large crow flocks. The good news is that the excessive crow-killing has aroused some opposition, even among hunting organizations, but it remains to be seen whether this opposition will be able to rein in the Crowbusters. "I've never experienced such feverish hunting of a particular species, not even when it comes to foxes," says Johann Beuke, a 56-year-old resident of Twistringen, a town in Lower Saxony, and a member of Germany's ÖJV ecological hunting association. 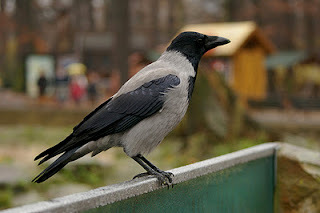 According to Beuke, crow populations are particularly threatened by the fact that many German states have bowed to hunter pressure by virtually eliminating hunting off-seasons. In doing so, they are contravening not only an EU directive on the conservation of wild birds, but also Germany's Animal Protection Act. In an attempt to put a stop to what Beuke calls "extermination campaigns," the ÖJV has teamed up with Friends of the Earth Germany (BUND) and the Nature and Biodiversity Conservation Union (NABU). These large-scale killing sprees are even too much for some conservative hunters. Harry Neumann, a local BUND representative, convinced Klaus Skowronek, the head of a hunting club in the western German Westerwald mountains, to no longer allow the Crowbusters to hunt in the region. "As far as we're concerned, this area is now a no-go," Skowroneky says, adding that he finds "crow pingpong distressing." Even the conservative German Hunting Association (DJV) has recently decided that the "excesses" and "questionable images" associated with the Crowbusters' actions could hurt the image of hunting in general. In late February, the association plans to address the problem of these marauding crow killers. Hopefully this senseless practice will end soon. I find that songbirds are tricky to photograph since they often hide in grass and shrubs where branches and stems block the way, and there is plenty of opportunity for the autofocus to pick up something other than my intended subject. This Song Sparrow tried hiding in the phragmites, but I found it anyway. Even so, it is blocked by a reed. This gull was walking around with its bill slightly ajar. It seemed almost as if it was trying to cough something up, or perhaps swallow something big. Either way, I never saw what went in or came out of its bill. Birds leave evidence of their presence in any patches of fresh or dried mud around Donaldson Park. Based on the size, this appears to be the work of a Canada Goose, though I suppose one of the larger gulls could have left it. Yesterday morning I took my first bird walk at Cheesequake State Park in a few months. According to the park's website, the park reached its goal for this winter's hunting season of 100 white-tailed deer killed, so there will not be any more hunting at the park this winter. The park chose to introduce a hunting season to control the deer population, which had substantially reduced the amount and biodiversity of the understory in the park's wooded areas. How effective it will be remains to be seen, but I hope it will have some positive effects and begin the process of restoring some breeding bird diversity to the park. Speaking of the park's breeding birds, one of the most prominent species during yesterday's walk was the White-breasted Nuthatch. There were numerous nuthatches along the trails, and many of them were very vocal, almost as if they felt spring's onset and were claiming their territories. Quite a few nuthatches were concentrated around the feeders at the nature center. It was there that I had a chance to photograph some of them at close range. This has been an unusual winter in several ways, not least of which has been the persistently warm weather. A cold snap has rarely lasted longer than a day or two, and the first snow of the winter did not arrive until last weekend. One consequence of this is that the normal spring processes are running ahead of schedule. Daffodils have been sprouting over the past few weeks. Yesterday afternoon, it was warm enough for a slug to be out and active. A pair of endangered Short-tailed Albatrosses has produced a chick for the second year in a row at Midway. 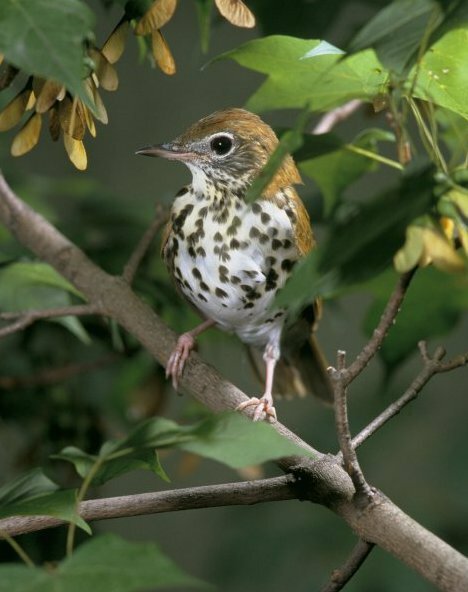 Songbirds that prey on caterpillars focus their hunting on certain types of trees, like cherry trees, that are most nutritious for the caterpillars. A new study finds that Archaeopteryx had black wing feathers. The RSPB's Big Garden Birdwatch is happening this weekend, January 28-29. If you live in the U.K. (or will be visiting), please contribute to this citizen science project. Here is a gallery of some birds featured in the count. Starlings have a contradictory image: they are often unwelcome at birdfeeders (and are invasive in North America), but people are thrilled to see their massive murmurations near roosting sites. Scientists have found new concentration and breeding areas for the threatened Japanese Murrelet. A Blackbird is not a black bird when it has a case of leucism. Jason Berry set a new big year record for Washington, DC, with 218 species in 2011. The Birdist: Are Birds Dislocated By Global Warming "Countable"? The Freiday Bird Blog: Rare and Hurt and, What Do Birds Mean to You? Nemesis Bird: Townsend’s Warbler in PA! The USDA issued an updated Plant Hardiness Zone Map. This new map reflects warming due to climate change. Barack Obama addressed 8 environmental issues in the State of the Union address; all were energy-related and none addressed wildlife conservation directly. Mountain yellow-legged frogs of the Sierra Nevada may be classed as endangered since their population has fallen 90% due to the spread of a chytrid fungus. A rainforest survey in southern Suriname found 46 new species and 1,300 species overall. The overall species total included 215 species of birds. The newly-discovered species included one new frog, eight new freshwater fish, and many insects. Here is a gallery of some of the new species. A British woman crossed Antarctica on skis. During early stages of BP's oil spill in the Gulf of Mexico, the Obama administration pressured government scientists to underestimate the flow rate from the broken wellhead. A federal judge ruled that Transocean, the owner of the Deepwater Horizon rig, was not responsible for some civil compensatory claims but would have to pay fines and punitive damages. The biggest trees in the world are already on the decline and face further challenges from climate change. Despite greater environmental awareness and regulations, 87 species of marine mammals have been eaten in 114 countries over the past two decades. In fact, consumption of meat from marine mammals has been on the rise since the 1970s. Restored wetlands are rarely as good as original wetlands at harboring biodiversity and sequestering carbon. This finding supports the need to protect original wetlands wherever possible. The Obama administration issued a new forest management plan that it says will rely to a greater extent on science and collaboration with outside conservation groups. A new study by scientists at the Biodiversity Research Institute confirms that songbirds suffer harmful effects from ingesting methylmercury, one of the toxic chemicals produced by burning coal for energy. Despite some moves towards cleaner energy sources, coal is still the principal fuel for producing electricity through much of the Midwest and Northeast. The emissions from power plants include methylmercury in addition to carbon dioxide and other chemicals; the methylmercury is absorbed by tree leaves or falls to the ground in rainstorms and subsequently enters the food web. The new study found dangerously high levels of mercury in several Northeastern bird species, including rusty blackbirds, saltmarsh sparrows and wood thrushes. Previous studies have shown mercury’s effects on loons and other fish-eating waterfowl, as well as bald eagles, panthers and otters. In one study, zebra finches lost the ability to hit high notes in mating songs when mercury levels rose, affecting reproduction. And the results of mercury poisoning were quite severe, even at fairly low levels of contamination. Songbirds with blood mercury levels of just 0.7 parts per million generally showed a 10 percent reduction in the rate at which eggs successfully hatched. As mercury increases, reproduction decreases. At mercury levels of greater than 1.7 parts per million, the ability of eggs to hatch is reduced by more than 30 percent, according to the study. Over all, birds in contaminated sites were found to be three times as likely to abandon their nests or exhibit abnormal incubation or feeding behavior. In some nests, the chicks seemed to have been affected most; they vocalized less and did not beg as aggressively to be fed. Such consequences mimic the effects of mercury on humans whose primary contact with the toxin is through the consumption of fish. The contamination can be passed to children in the womb or while they are nursing, damaging their nervous systems and impairing their ability to learn. The authors found similar effects in bats that they tested. Perhaps the new mercury regulations will reduce some of these problems over the next decade or two. The U.S. Postal Service® salutes five kings of the sky with the Birds of Prey stamps: the northern goshawk (Accipiter gentilis), peregrine falcon (Falco peregrinus), golden eagle (Aquila chrysaetos), osprey (Pandion haliaetus), and northern harrier (Circus cyaneus). Birds of prey, also known as raptors, thrive in diverse habitats and live on every continent except Antarctica. The roughly 500 species of raptors include birds that hunt by day, such as falcons, eagles, and harriers, and birds that hunt by night — the owls. They share several common characteristics; birds of prey are carnivorous and use their powerful talons to capture prey. Their exceptionally keen eyesight allows them to see small objects in detail, even from a great distance. As predators high on the food chain, raptors play an important role in maintaining the balance of nature. Illustrator Robert Giusti worked with art director Howard E. Paine on this issuance. Giusti painted the original designs in acrylic on canvas board. The "Birds of Prey" stamps are being issued in self-adhesive sheets of 20 at an 85-cent denomination, which is the price for single-piece retail First-Class Mail weighing more than two ounces and up to and including three ounces. I doubt I would have use for a sheet of these since I rarely send letters that heavy, but if you do, these are some stamps to use. Other wildlife-related stamps currently available include the 65-cent Baltimore Checkerspot stamps and the first-class Save Vanishing Species stamps featuring an Amur Tiger. The irruption started in late fall and is expected to end by March or April. In few places are people as excited as in Kansas and Missouri, where snowy owls are exceedingly rare. Ninety have shown up in Kansas this winter and 40 in Missouri. Until this year, the highest number counted in Missouri had been eight. “It’s a massive movement,” said Mark Robbins, the ornithology collection manager at the University of Kansas. Geoff LeBaron, director of the Audubon Society’s Christmas bird count, said that it was hard to estimate how many snowy owls flew south in this irruption because the latest data has not been tallied, but that the overall number was probably a few thousand. Despite the surge, the society says, snowy owls are thought to have been in decline since 1945. There is far more data on the scope of this migration than in years past, thanks to a citizen science project based at Cornell called eBird, which is run by the Cornell Lab of Ornithology and the Audubon Society. Bird-watchers around the country call in sightings, which are plotted on a map that shows precisely where the birds are wintering. Additional hot spots include the mouth of the Columbia River in Washington State, with 10 to 13 birds; 20 at Lake Andes National Wildlife Refuge in South Dakota, and 30 in Boundary Bay, near Vancouver in British Columbia. The owls are even showing up in urban and suburban areas, along highways, on signs and fence posts, and in other places where people can more easily spot them. It has been a good snowy owl year at Logan Airport in Boston, too. Because the airfield looks like tundra, snowy owls tend to flock there, and they must be trapped and removed. To be more precise, birders do not "call in sightings" to eBird but enter sightings through web-based checklist forms on the eBird website. For more on the causes behind this year's Snowy Owl irruption, see this post by David Sibley. He gives a more clear account of what probably happened than The New York Times does. I have only seen the one Snowy Owl (pictured) that was present at Merrill Creek Reservoir so far this winter. 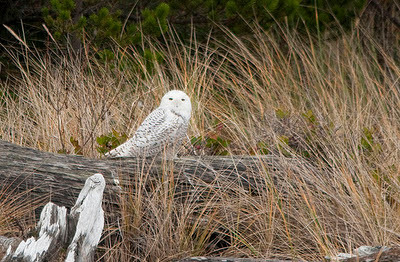 So this winter has not been quite as memorable for me as the winter of 2009, when I saw four Snowy Owls over the course of the winter, or the winter of 2010, when I saw two Snowy Owls at Parker River NWR in Massachusetts during the Superbowl of Birding. As birders we encounter a lot more than birds during the course of our birdwatching. These organisms are often interesting and beautiful in their own right, but knowledge about their life histories and how to identify them can be spread across many identification guides, some quite technical. A solution is now available for the southeastern coastline of the United States in the form of Noble S. Proctor and Patrick J. Lynch's A Field Guide to the Southeast Coast & Gulf of Mexico. This new book follows in the footsteps of the pair's A Field Guide to North Atlantic Wildlife from 2005. Unlike the habitat guides in the Peterson series, which focus on identifying ecosystem types from indicator species, Proctor and Lynch's guide will help identify prominent species within coastal ecosystems. "Southeast coast" for this book is defined as the U.S. coastline from North Carolina to Texas-Mexico border. This includes beaches, brackish bays and salt marshes, and the Atlantic Ocean and Gulf of Mexico to the edge of the continental shelf. Ecosystems there are influenced by offshore currents, principally the Gulf Loop Current and Gulf Stream. It is also shaped by the many streams and rivers that flow into the Atlantic and the Gulf. These build up barrier islands with sediments and nourish salt marshes with nutrients, which allow such diverse ecosystems to flourish. 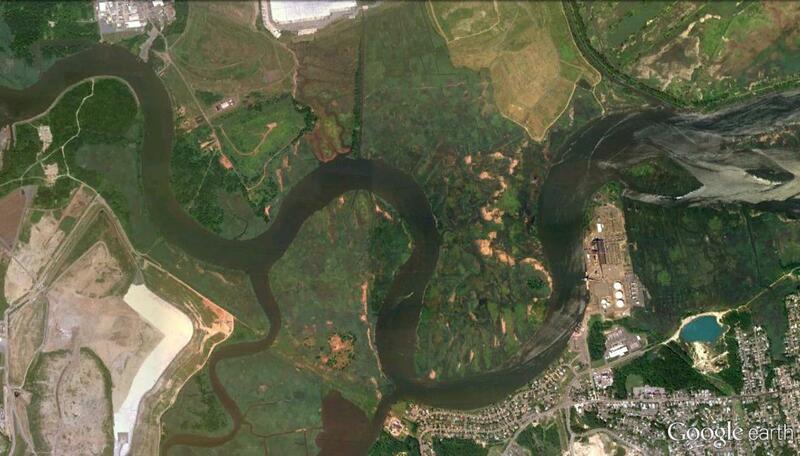 These estuaries are important conduits for annual migrations – for birds that stop to feed along the way and for saltwater fish that must swim upstream to spawn. Humans are also altering these ecosystems through climate change, pollution, overfishing, and building artificial reefs offshore. Birds are are the most conspicuous creatures in coastal habitats, and they get extensive treatment in A Field Guide to the Southeast Coast & Gulf of Mexico. Coverage of birds is limited to raptors and waterbirds, and even within those boundaries, it is incomplete. Rails, for instance, are not included. The bird illustrations are generally useful and accurate. I was surprised, though, not to see a depiction of the pale southeastern form of the Red-shouldered Hawk. The depiction of an immature Black-crowned Night-Heron looks misshapen. Fish and sharks also receive extensive coverage, with an emphasis on commercially-important fish. Plants and marine invertebrates get compressed treatment. If you have an interest in botany or collect and identify seashells, you may want more specialized guides for those subjects. (I do not know which to recommend.) Other groups treated in the guide include aquatic reptiles (mainly sea turtles and crocodilians) and marine mammals. As part of their emphasis on conservation issues, the authors highlight the names of endangered and threatened species (according to the IUCN Red List) in red. It is particularly striking to see just how many species are threatened. In some cases whole pages of sharks, fish, or marine mammals are red. Proctor and Lynch's A Field Guide to the Southeast Coast & Gulf of Mexico covers the most notable organisms of the southeastern coast and offshore areas of the U.S. 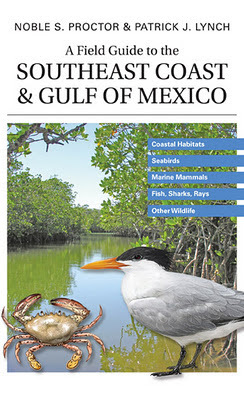 It would serve as a useful field guide for casual visitors to southeastern beaches, anglers and scuba divers, or for birders looking for help identifying non-avian wildlife. However, it is not sufficient as a stand-alone bird guide, even for waterbirds. For complete coverage of birds, I would suggest turning to the recently-published 6th edition of the National Geographic guide or David Sibley's guide for eastern birds. Oddly enough, yesterday was the first snowfall here since the winter started a month ago. These trees stood together in Donaldson Park. The Greater White-fronted Goose was nowhere to be found. Two sets of bare branches stand against a late afternoon sky. The first is a London plane tree. I am not sure about the second, but chances are that it is a honey locust. A recent study attempts to explain why Barn Owls are able to fly noiselessly. Cited factors include its slow flight speed, wing curvature that allows each wing beat to produce more lift, and soft fringes on the wings and dense plumage overall that muffles sound. Tiger sharks in the Gulf of Mexico are eating songbirds disoriented by the lights on oil rigs. Someone recorded video of a Hooded Crow snowboarding on a rooftop in Russia. Native forest birds in Hawaii are having trouble completing their annual molts. The likely cause is lack of food due to competition with introduced species. European birds and butterflies are having difficulty moving north quickly enough to keep pace with climate change. Neurotic Physiology: Friday Weird Science: Is that ostrich flirting with me? This week, the Obama administration denied a permit for the Keystone XL pipeline, which would have carried oil from tar sands mines in Alberta for refining in Texas. The State Department said that it needed more time to evaluate the project than the 60-day deadline imposed by Congress in December. Cancellation of that route could mean more tanker traffic departing from British Columbia. The Obama administration also left the door open for TransCanada to reapply with an alternate pipeline route. Here are some of the animals that would be affected by the Keystone XL pipeline's route. In 2009, scientists discovered over 19,000 new species. These included 7 birds, 41 mammals, 120 reptiles, 148 amphibians, 314 fish, 626 crustaceans, 9,738 insects, 1,360 fungi and 2,184 plants. That brings the number of known species over 1.9 million, but there may be as many as 10 million undiscovered plant and animal species. According to NASA, 2011 was the ninth-warmest year on record. Here is an animation of the average global temperatures since 1880. The Amazon is actually two distinct forests, one much richer in biodiversity than the other. The Catalina Island fox has rebounded from a low of 100 individuals in 1999 to 1,542 today thanks to conservation efforts. The population had been about 1,300 before it was devastated by an epidemic of distemper. About six million bats have died from white-nose syndrome in the past six years – many more than previously estimated. Here is an interview on the disease's potential for spreading west. As I was wrapping up my usual circuit around Donaldson Park yesterday afternoon, I stopped to scan the 300+ Canada Geese in the field next to the tennis courts. On my first scan, I didn't notice anything unusual, but I then heard a high-pitched, three-noted honk that I knew was not made by a Canada Goose. I scanned again and found a Greater White-fronted Goose fairly close to me. Since it showed no signs of flying away, I sat and watched it for a while as it foraged in the soccer field. Though it was slightly smaller than the Canada Geese in the same flock, it mostly held its own against its neighbors and occasionally fought back when they got too aggressive. Greater White-fronted Geese breed in the Arctic across the northern hemisphere. Three subspecies breed in Alaska and Canada, and one subspecies that breeds in Greenland, flavirostris, is a rare visitor to the U.S. east coast. Members of this subspecies are somewhat larger and darker than the other subspecies and have an orange bill, all of which are consistent with the bird I saw, though I hesitate to call it such without having other birds for comparison. Greater White-fronted Goose is a fairly uncommon bird in eastern North America, though this winter may be an exception to that rule. Most of the flavirostris population migrates eastward to winter in Ireland and Scotland, and most of the continental North American populations migrate west of the Mississippi. That makes it a good county bird in addition to being a really good county bird. Aside from the unusual goose, I mostly saw the usual birds during my walk yesterday. One exception was a pair of Peregrine Falcons that I saw fly upstream along the river. The falcons were flying in tandem and briefly put all the gulls to flight. The gulls all settled down when the falcons continued on their way. EBird is encouraging its users to add distribution data to its database by birding underbirded areas. eBirders often email us and ask where they should go birding to make the biggest impact in regions with little data. It's perhaps little surprise that eBird checklist submissions are most dense in areas with large human populations, so getting away from those areas is a good first step for filling in the data gaps in eBird. But seeing these gaps can be really astonishing, and with the help of map wizard Paul Hurtado, we've come up with a neat way to visualize eBird data density at the county level. These maps are a visualization of the total number of eBird checklists submitted in each US county in the month of January across all years. Pull up your state map and see how your home county is faring. And better yet, find a county that's white, pink, or yellow, and go do as many eBird checklists as you can there this January! They provide a map that shows each of the states in detail. The lighter-colored counties are the ones with the least amount of data. My state is very well covered with few real gaps. The lesser birded counties are one urban county (Essex) and two far-flung rural counties (Sussex and Salem). Yesterday I joined Patrick Belardo to check out some of the waterbird hotspots around Middlesex County. We started out at the Edison Boat Basin, where a Glaucous Gull has appeared regularly for the past week or so. At that point, the river was partly frozen, and there were relatively few gulls present. Those that were huddled together at a distance, too far and too tightly-packed to pick out the gull in question. Our second stop was at Old Bridge Waterfront Park in Laurence Harbor, which sits on top of a Superfund site. (A plan to clean up the site is still pending.) This park offers a broad view of Raritan Bay from a different angle than is available from South Amboy or Pirates Cove. There were many rafts of waterfowl visible, but most of them were pretty far out. The most numerous seemed to be Greater Scaup, followed by American Black Ducks. We tried to pick out some Lesser Scaup or other unusual ducks without success. The flocks included three Common Goldeneyes and a few Hooded Mergansers. One Horned Grebe was visible very far out. At Morgan Avenue in South Amboy, we saw mostly the same species as at the previous stop, with the exception of a lone Sanderling and a huge flock of Brant. A stop at Raritan Bay Waterfront Park was a bit more productive. In addition to the same flock of Brant, we were able to spot Red-breasted Mergansers, a Red-throated Loon, and a Horned Grebe. Just before we left the park, Patrick noticed an immature Bald Eagle flying over the mouth of the Raritan River near Perth Amboy. Most of the ponds on our route were frozen over, so few birds were present on them. Waterworks Park in South Amboy had the same flock of American Coots that I saw there several weeks ago. (The Redhead was gone, though.) A large flock of gulls at Townelake in Sayreville included one adult Lesser Black-backed Gull that Patrick picked out while the bird was still asleep. A stop at Sayreville Marsh was our most productive of the morning. The waterfowl on the river included two Ruddy Ducks, an American Wigeon, and a Canvasback. (I initially thought it was a new county bird for me, but it turned out not to be.) A Great Cormorant flew past us, and another was sitting on one of the pilings. Patrick spotted a raptor hovering over a distant landfill (the one across the river from the industrial site). When it was hovering faced towards us, few markings were visible, but when it turned in circles, a light head and white tail band became visible. Through his scope, it was possible to see the dark underwing markings characteristic of a light-morph Rough-legged Hawk. Unlike the Canvasback, this was a new county bird for both Patrick and me; it leaves me at 200 birds in Middlesex County. After Sayreville Marsh, we stopped once more at Edison Boat Basin to check for the Glaucous Gull and found... Fish Crows. So that wrapped up a good morning of birding. This little clump of jelly fungus was on the side of a tree at the John A. Phillips Open Space Preserve on Saturday. Jelly fungi (order Tremellales) are so-called because of the gelatinous consistency of their fruiting bodies. This may be the species known as brown witch's butter (Tremella foliacea), also known as jelly leaf. That species occurs late in the season and grows on both hardwoods and conifers. The species parasitizes other fungi that grow on the same trees. Yesterday I had the chance to explore a park I had not visited before, the John A. Phillips Open Space Preserve in Old Bridge. The park is one of several within the Spotswood Outlier, the northernmost portion of the Pine Barrens. While the Spotswood Outlier is separated from the main body of the Pine Barrens by about ten miles, it is ecologically very similar. The soil is very sandy, and the woodland is a mix of oaks and pitch pines. While the woodland was lovely, there were relatively few birds around yesterday. I encountered a few mixed flocks that seemed to be mostly Tufted Titmice and Carolina Chickadees. One flock had a Brown Creeper and Hairy Woodpecker in addition to the more common birds. I am not sure whether these holes were the work of a woodpecker or larvae of some sort. Perhaps both were involved. Most insects we encounter are benign, even beneficial, performing pollination services or breaking down waste and debris. Even spiders and centipedes, the arthropods most likely to creep me out, are unlikely to pose a threat to humans and help control various household pests like flies, silverfish, and roaches. However, there are a proportionately small number of arthropods that can be annoying, destructive, or worse in their interactions of humans. Many of these are treated in Amy Stewart's latest book, Wicked Bugs: The Louse That Conquered Napoleon's Army & Other Diabolical Insects. The "bugs" of Wicked Bugs are not strictly true bugs, insects in the order Hemiptera. Stewart uses the term in its popular sense to refer to small creatures with jointed legs, and even to some that are not strictly arthropods. These include insects, spiders, scorpions, centipedes, millipedes, ticks, worms, and more. 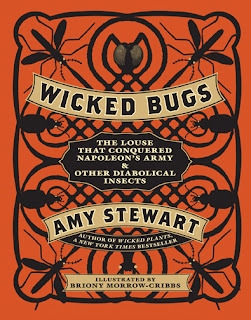 Each "wicked bug" is treated separately, with its own short account of incidents in which the species figured prominently. Stewart follows up with the bug's life history and what, if anything, can be done to prevent or cure outbreaks. Interspersed among the individual accounts are short chapters treating groups of insects together, such as garden pests, stinging ants, or destroyers of books. (The latter account contains a quote attributed to Desiderius Erasmus: "books, to be saved from the worms, must be used.") The accounts are labelled with scary-sounding terms like "painful," "destructive," "horrible," or "deadly." Where possible, Stewart includes major contemporary issues like Formosan subterranean termites undermining the integrity of floodwalls (and other structures) in New Orleans or swarms of sand flies attacking U.S. soldiers stationed in the Middle East. The book has some bias for pests that affect North America and Europe. Many of the most serious insect pests in these two regions were imported, usually accidentally. However, the book covers dangerous insects from all over the world. Some of the most fearsome insects come from tropical regions. Some were already familiar to me, either from first-hand experience or from reading about them, but many were not. I would recommend Wicked Bugs to anyone with an interest in insects or who wants to learn more about preventing insect pests. Despite its cringe-worthy subject matter, the text is engaging and informative and may appeal even to people who do not like insects all that much. When it comes to problem insects, knowing what they are and how to deal with them is half the battle. The High Bar w/Warren Etheredge & Amy Stewart from The High Bar on Vimeo. 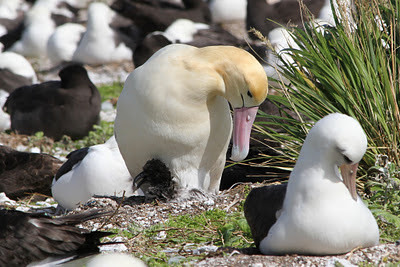 Wandering Albatrosses are benefiting from climate change since changes in winds near the South Pole have allowed them to take shorter and more frequent foraging flights. This has resulted in healthier offspring. The changes are not necessarily long-term, however, as further warming is expected to change the winds again. 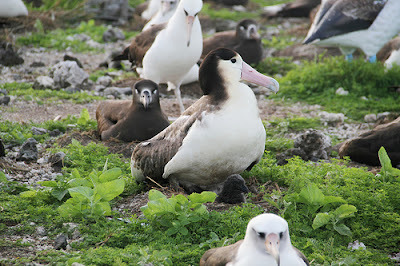 The US Fish and Wildlife Service is planning to regulate the Hawaiian swordfish fishery to protect endangered Short-tailed Albatrosses, a pair of which recently started breeding on the Midway atoll. Because of a warming climate, elk have been overgrazing songbird habitat in mountainous areas of Arizona. The elk are having a negative effect on Red-faced Warblers, among other species. A Chinstrap Penguin spotted in the South Shetland Islands appears to have isabellinism, a genetic mutation that dilutes its feathers' pigments. This penguin appears almost like an albino, but with a pale brown back. There is a picture of this unusual bird at the link. Here is a photo of a Blackthroat, a member of the robin family. Zebra Finch chicks are able to recognize their relatives by smell. The series on Elegant Quail in The New York Times wraps up this week. Here is an interview with the author of The Owl and the Woodpecker on this year's Snowy Owl irruption. The Nemesis Bird: Birds in Flight – Evening Light: Using the ‘Golden Hours’ to get great flight shots! 10,000 Birds: What is a Kumlien's Gull? The US EPA released data on greenhouse gas emissions throughout the country for the year 2010. At the link you can find information on the top polluters in your state. Here is the emissions map for New Jersey. You can refine the search to the county level as well. A camera trap took the first known photograph of a Myanmar sub-nosed monkey. The species was described in 2010 from a specimen killed by a hunter, but the species has never been encountered alive in the wild by a scientist. Secretary Salazar approved a 20-year ban on mining around the Grand Canyon. The ban covers mining of uranium and other minerals but not exploration for oil or natural gas. A new snake species, Matilda's horned viper, was discovered in Tanzania. The species is assumed to be critically endangered based on its rarity. It is worth clicking through to see the photos of it. National parks will waive admission fees this weekend in honor of Martin Luther King Day. The National Park Service has posted a list of the fee free dates and parks for 2012. Increasing urbanization in Bolivia and Peru is threatening to overwhelm Lake Titicaca with sewage and other pollutants. Gulf currents helped break down the oil spewing from BP's broken well by circulating oil-eating bacteria back to the wellhead again and again. As a result, oil disappeared more quickly than it would have otherwise. During the Long Branch CBC, Patrick's friend Mike spotted a banded Ring-billed Gull at Spring Lake. I stopped and photographed it to record the band code, JX3, in white lettering on a blue band. Yesterday I was reminded to submit it by a comment on the photo above. Once I did submit it, I got a response pretty quickly. This gull was banded at Île Deslauriers in Québec on June 8, 2011. Île Deslauriers is just a little north of Montréal. At the time of its banding, this gull was an adult. You can read more about the study on the project website. Following up on yesterday's post, here are the current statuses of the other two Whooping Crane flocks in the United States. The cranes mentioned yesterday are part of an eastern migratory flock that conservationists have been trying to establish to help the species recover. That flock spends its summers in Wisconsin and winters in Florida. 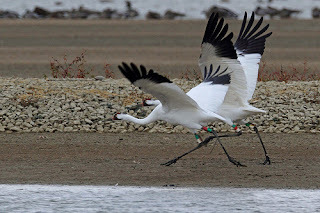 The cranes in the eastern flock can all trace their ancestry to captive birds from the western flock, which breeds at Woods Buffalo National Park in northern Canada and winters at Aransas National Wildlife Refuge in Texas. This is the only Whooping Crane flock that I would call truly wild, as its breeding and migration are unassisted by humans. That flock may face trouble this winter thanks to a severe drought. “We’re in the midst of a drought compounded by the presence of red tide,” says Dan Alonso, manager of Texas’s Aransas National Wildlife Refuge. The refuge is an over-wintering ground for the cranes. Lack of freshwater has made the waters too salty for crane dietary staples like blue crab and wolf berries, as well as boosting toxic red tide. With nothing to eat, surviving the winter will be a challenge and malnourished cranes may not have the energy and resources to return to their breeding grounds, Canada’s Wood Buffalo National Park. Water for whooping cranes is the subject of an ongoing lawsuit filed in 2010 by The Aransas Project against the Texas Commission on Environmental Quality. The Project pointed to water management during a 2009 drought—a winter in which 23 cranes died—as causing harm to a federally-recognized endangered species. The two-week trial concluded in December, and the outcome could force the commission to consider cranes in water management. For now, the Aransas refuge is taking its own steps to save freshwater, including collecting rainwater. Alonso noted that about 9,000 acres of proscribed burns are planned to open habitat for the cranes. He also asked that visitors keep their distance from the birds, to prevent stressing the cranes further during these tough times. Meanwhile there is an attempt underway to create a third, presumably nonmigratory, flock in Louisiana. Despite the rough start, state officials are moving forward with plans to bring more cranes to the White Lake area, about 40 miles southeast of Lake Charles. They released a second group of 16 young birds into the marshes in late December. 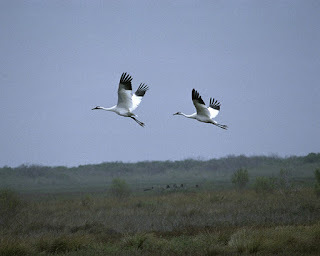 Louisiana was home to whooping cranes until 1950. With the species near extinction, biologists removed the last one from the area for its protection. Experts attribute the species' decline in the state to hunting activity, flooding and the conversion of tall-grass prairies into rice fields. Still, they see the area as an ideal place for the birds because of its remoteness and abundant fresh water. The FAA granted Operation Migration a one-year waiver to the rule banning pilots to receive pay for playing ultralight aircraft. Nine young whooping cranes grounded in Alabama since December can resume their winter migration to Florida guided by their surrogate mother -- an ultralight aircraft, the Federal Aviation Administration decided today. Because the endangered birds were in mid-migration, the FAA granted a one-time exemption to let Operation Migration continue, The New York Times says. The hatchlings, the ultralight and its human pilot (wearing a bird costume) have been cooling their heels in Franklin County, Ala., about 550 miles from their final destination. They left Wisconsin in late fall. Presumably this will allow the young cranes to reach their assigned wintering grounds in Florida before the winter ends. Meanwhile, Operation Migration will need to either work out its issues with the FAA or come up with a new plan for helping the birds migrate next fall. Yesterday was not nearly as warm as Saturday, but it still was not very cold. I took a short walk around Donaldson Park and added a few new year birds for my county. Soon after I entered the park, a flock of Red-winged Blackbirds flew overhead. As I rounded the trail past the boat ramp, I noticed a Hooded Merganser swimming with a couple of Mallards. That sighting means that I have now seen all three species of merganser in the county this year. (Now, does anyone have a spare Smew?) Finally, there was a Red-tailed Hawk sitting on top of the radio tower, a species I somehow had not seen yet this year. Canada Goose numbers were down yesterday (perhaps because of extra people walking dogs and running remote-control cars around), and I was not able to find the Cackling Goose among the relative few that were present. Yesterday morning, I walked most of the length of Johnson Park, or at least most of what it easily accessible to the public. None of the birds were particularly extraordinary, but a few are not always easy to find in the county. First off, there were huge numbers of gulls, and almost all of them seemed to Herring Gulls. I estimated about 950 Herring Gulls spread over 3 or 4 flocks, with the largest flock having 500 Herring Gulls in it. Try as I might, I was not able to pick out any unusual gulls in those flocks. Canada Goose numbers seemed on the low side for that park (only 620), but it is possible that some had already left by the time I counted them. As usual, there were a lot of waterfowl gathered around the Landing Lane bridge. These included Common Mergansers, Common Goldeneye, Ring-necked Ducks, and Bufflehead. I crossed the bridge and walked a bit up the canal towpath to get a better look at the latter two species. By the way I got to their original location, though, most of them had disappeared, so the extra distance did not really pay off much. Between Landing Lane and East Jersey Olde Towne, I found a Brown Creeper along the edge of the woods. I also saw two Cooper's Hawks. One was getting harassed by crows across River Road from the stadium; the other was sitting in a creek near the railroad bridge. One other notable sighting was a Great Blue Heron that was standing in a creek near the Rt 18 bridge. I rarely see Great Blue Herons foraging in a location that densely wooded on both sides. Yesterday was unusually warm, with a high of at least 64°F. December temperatures were well above average, and we have had only a few short cold spells, so it was no wonder to see daffodils poking up through the leaves. Still, I take it as an indicator of just how crazy this winter has been. On Thursday afternoon, I found a small goose among a flock of over 600 Canada Geese in Donaldson Park near the tennis courts. After watching it for a while I concluded that it was most likely a Cackling Goose based on a combination of features. Its bill was noticeably short compared to nearby Canada Geese, its head was fairly blocky, and its back and undersides were noticeably pale – almost grayish – compared to the nearby geese. This feature stood out more in person than in my photos. It was also small compared to the flock as a whole, though quite of the Canada Geese were smaller than average themselves. When I returned to the park yesterday afternoon, the Cackling Goose was there again, this time in the field at the foot of Second Avenue. A few other notable birds were also present in Donaldson Park on Friday afternoon. One was the American Pipit shown above, which flushed from the field at the foot of Second Avenue and landed in the nearby brush. Another was an adult Lesser Black-backed Gull that was among a huge gull flock (mostly Herring Gulls) between the park and Rutgers Boathouse. To cap things off, a Merlin flew by while I was walking at the other end of the park. Tom Reed set a new big year record of 362 species for New Jersey in 2011. The old record of 337 was broken by five birders in 2011, and a few other birders came close to matching the record. The Whooping Cranes led by Operation Migration have been grounded due to a legal dispute over the operation of the ultralight aircraft. The kittiwake population has fallen by 40% since 2000 in the U.K. All seabird colonies in that country have suffered losses over the same time span. Hitchcock's famous film, The Birds, was partially inspired by an incident in 1961 when thousands of seabirds in the San Francisco became disoriented and died. The incident is now believed to have been the result of an algae bloom that produced domoic acid; when seabirds ate marine animals that had consumed the acid, they too became poisoned by it. 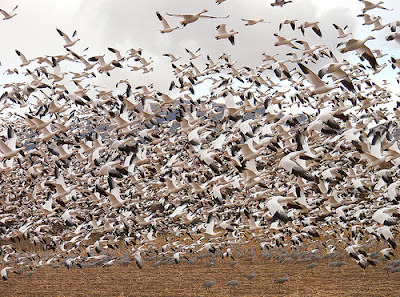 Programs to protect Snow Geese have worked so well that some conservationists worry that the population is too large and has started negatively affecting smaller species like Greater White-fronted Geese. What, if anything, to do about it remains in question. A recent expedition rediscovered the Timor Bush-warbler, which had not been recorded since its original discovery in 1932. Myrmecos: Did a parasitic fly cause Colony Collapse in bees? Here is a photo gallery of some animal species affected by the border wall along the U.S.-Mexico border. A trail camera captured a photo of wolf OR-7, which recently became the first wild wolf recorded in California since the 1920s. The FDA is restricting more antibiotics from use in livestock due to the growing problem of resistant bacteria. Organic foods may not be as sustainable as they seem; in some cases production of organic produce may overtax water tables or the food may be transported long distances. Last week, during the Raritan Estuary CBC, one of the parties found a drake Eurasian Wigeon along the Perth Amboy waterfront. The bird was later refound by other birders, including my friend Patrick, at the Cornucopia Cruise Lines docks a little further upstream from Perth Amboy. Yesterday I finally had a chance to go see the bird. It was not immediately visible from the Cornucopia parking lot, but I was able to find it by following a paved pathway from the parking lot upstream towards the Rt. 35 bridge. There were quite a few ducks tucked close to shore. In addition to the unusual interloper, there were American Wigeons, Gadwall, American Black Ducks, and Red-breasted Mergansers. Eurasian Wigeon is an unusual bird for New Jersey and is even rarer in Middlesex County. Most records in the state come from coastal hotspots like Cape May, such as the ones I saw there in January 2010 and again in November 2010. Given its rarity, it should not be a surprise that this was a new county bird for me, #199. Last year, thousands of blackbirds died on New Year's Eve in Beebe, Arkansas. This year it happened again, though in smaller numbers. "Well, there was just birds falling down on the street and people dodging and missing them," Taylor said. "And we were down the street picking them up. We got called out by the chief and we all [came] out trying to pick them off the street." Taylor added that the Game and Fish Department took about 30 of the nearly 100 birds for testing to try to determine what happened. Fireworks were blamed for the deaths of thousands of blackbirds last year, but it's unclear whether fireworks were the cause this time. Police imposed an impromptu ban on fireworks when the birds began falling this year. Lt. Brian Duke of the Beebe Police Department told ABC this year wasn't nearly as bad as last year, when the birds covered the streets of Beebe. This year, they were concentrated in a smaller area and the birds were cleaned up quickly. There haven't been any reports of people being hit by a falling bird. Biologists said last year's kill was caused by birds who were spooked off their roosts by the loud explosions and began flying into homes, cars, telephone poles and each other. Apparently the problem of birds being startled by fireworks is not limited to Arkansas. It turns out that birds are easily startled by fireworks. A study in the November/December issue of Behavioral Ecology used weather radar to track birds disturbed by New Year’s Eve fireworks for three years in the Netherlands. They found that thousands of birds took to the skies shortly after midnight and didn’t settle down again until 45 minutes later. The scientists estimated that hundreds of thousands of birds, including several species of migratory waterfowl, were disturbed by the fireworks each year in the Netherlands alone. “The unexpected loud noises and bright lights fireworks produce are probably a source of disturbance for many species of domestic and wild animals,” the scientists wrote. Most of the time, birds won’t die from the fireworks displays, as they did in Arkansas, the researchers note. But they still suffer from disrupted sleep, interrupted feeding and the energetic costs of flight and resettlement. This is such a consistent problem that perhaps the presence of large bird flocks should be a consideration in the timing and location of fireworks displays. 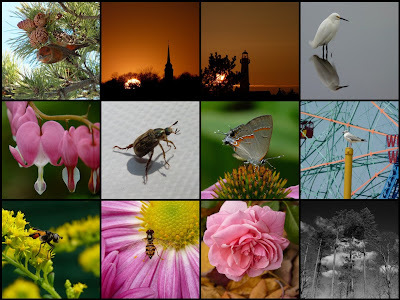 In 2011, I took at least one photo on every day of the year and uploaded it to Flickr. A lot of users do projects like this, sometimes called a 365 project. I never really announced that I was doing one but just tried to keep it going for as long as I could. Here is a sample of my best images from last year, one from each month. Eight of those twelve images were shot within a short walking distance of my home. From among those photos, I feel that my best was this image of a hoverfly I took in October. It was feeding on a chrysanthemum in my backyard. A lot of elements came together in a photo that I did not expect to turn out so well: good lighting, enough depth-of-field to keep most of the insect in focus, and a flower whose rays lead the eye naturally to the insect. I blogged about this image once before. My best bird photo of the year was probably this photo of a Snowy Egret that I took at the South Cape May Meadows in April. We are already on our third day of 2012, and I am still reviewing what happened last year. My blogging will turn to things from the new year soon, though. I saw ten life birds in 2011. Three of them were during the Superbowl of Birding in Essex County, Massachusetts. As it turns out, I will not be going there in 2012, but hopefully some other fun events will take its place this year. My best bird was probably the Gray-hooded Gull at Coney Island. The Varied Thrush I saw in Central Park was a species I had long anticipated seeing. The Greater White-fronted Goose at Duke Island Park made up for some frustrating misses on past attempts to see the species. Here are all ten of my life birds from the past year. 2011 turned out to be an excellent year for county birding. I had tremendous luck finding unusual species on my patch, particularly a Grasshopper Sparrow that surprised me one morning. I also had the opportunity to explore some parts of the county that I had not seen before or had not visited in a long time. Each of those visits added new species to my growing county list, which is twenty-eight species higher than it was this time last year. Here are the rest of my new birds for Middlesex County.